Migrate Outlook for Mac OLM files to any Office 365 plans. 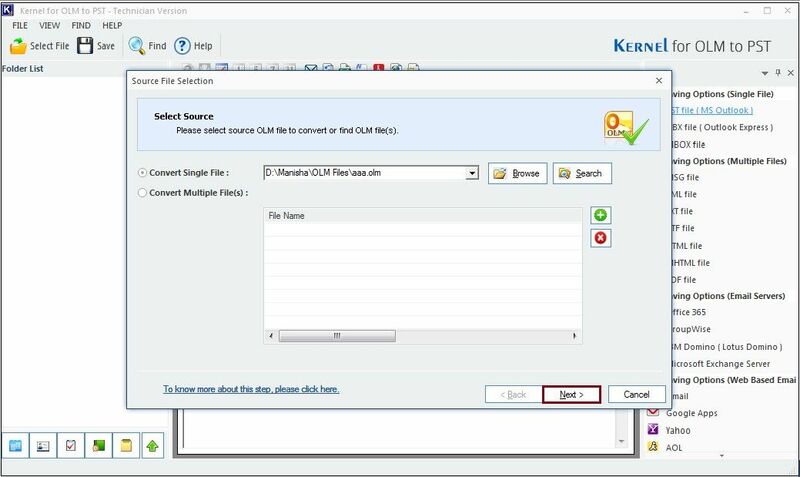 Allows you to efficiently migrate all your OLM files with all the items it contain like contacts, emails, hyperlinks, email attachments, etc. in quick and easy steps. Before you set the migration on fire, you can preview the items you want to migrate and exclude the ones which you do not require. 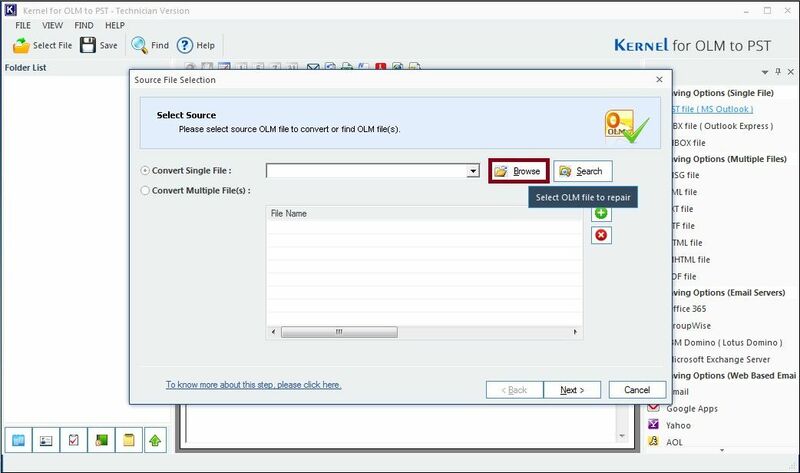 With the help of this tool, you can smoothly migrate all your OLM emails to Office 365 that too with filter application. There you can select what type of data you want to migrate and exclude the unnecessary data. 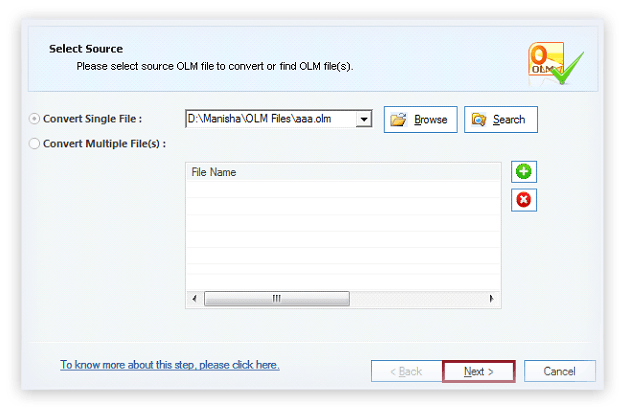 Even if you are looking for OLM to Office 365 migration, you can also use this tool to save the file in other formats like PST, DBX, EML, MSG, MBOX, IMAP, TXT, RTF, & HTML. So, you do not need another tool for this purpose. Advanced filter option provides you with the opportunity to migrate according to your preference. You can apply filters according to the specific data like From, To, Subject, etc. The software allows you to handle files as per your requirement, migrate either Single file or more than one files in one session. You need not to repeat the process for other remaining files. This tool is uniquely designed to work with all Office 365 plans, so you need not to worry about the compatibility with the plans for Office 365, you just make your data ready and leave the rest. You can run the software in all Versions of Windows from Windows 10/ 8.1/ 8/ 7/ Vista/ XP/ 2000/ 98/ NT/ 95 to Different Windows servers like 2016/ 2012/ 2008 R2/ 2008/ 2003 R2/ etc. While migration, you need not to worry about the data integrity. 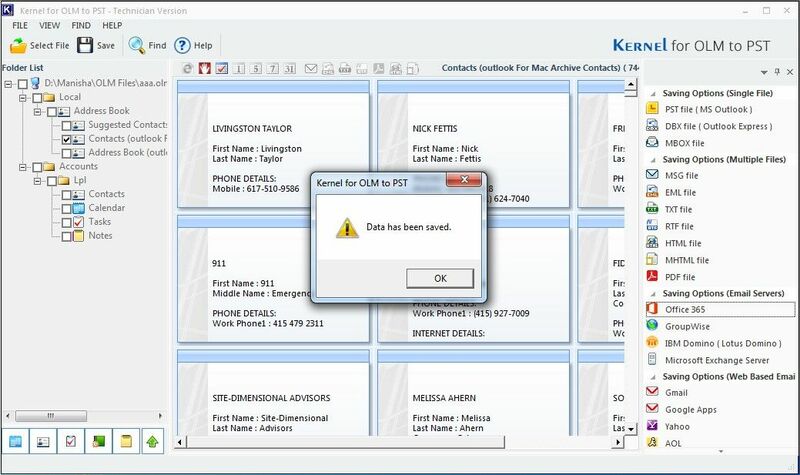 The software keeps total care of it and migrate your data as it was. If you still have doubts about the software, why don’t you try the Trial Version? It’s totally free and works exactly like the paid one. 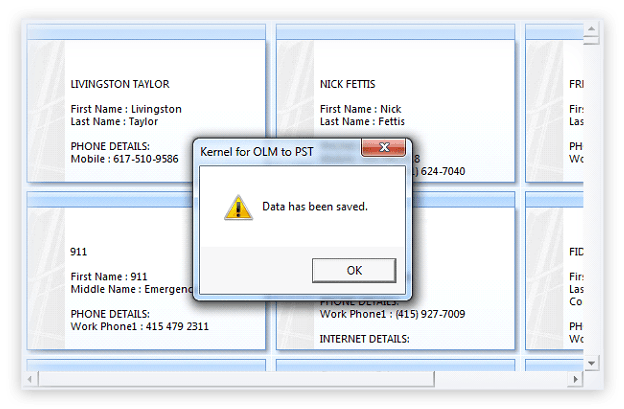 Kernel for OLM to Office 365 is the tool that allows you to migrate OLM files to Office 365 and the process is quite easy. See this simple three steps process. 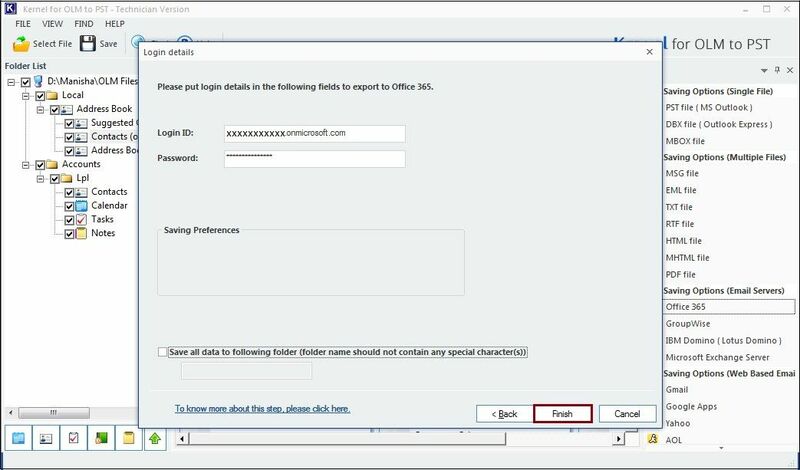 SelectSelect Office 365 as the migration destination and enter your credentials. 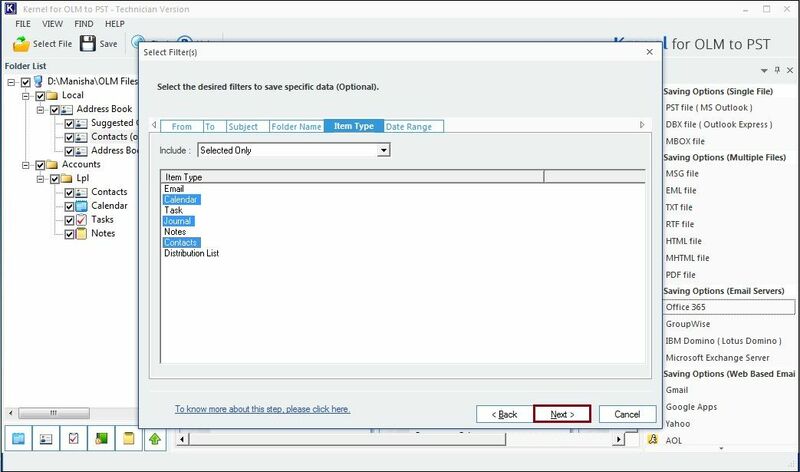 MigrateApply filters and saving preferences and save the file. Is it possible to reverse the migration process? Unfortunately not, once the migration is completed, you cannot undo it. Can I migrate multiple files from Trial version? Yes, of course. You can migrate single and multiple files from the trial version but can only save 25 items per folder. 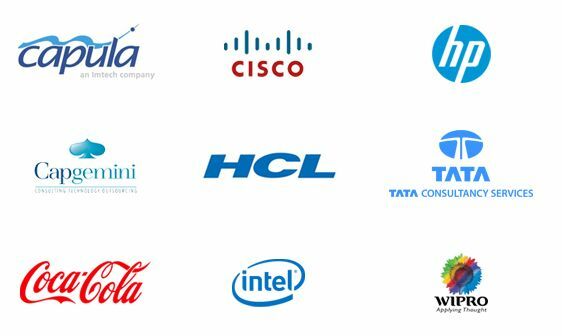 Can I only migrate Contacts? 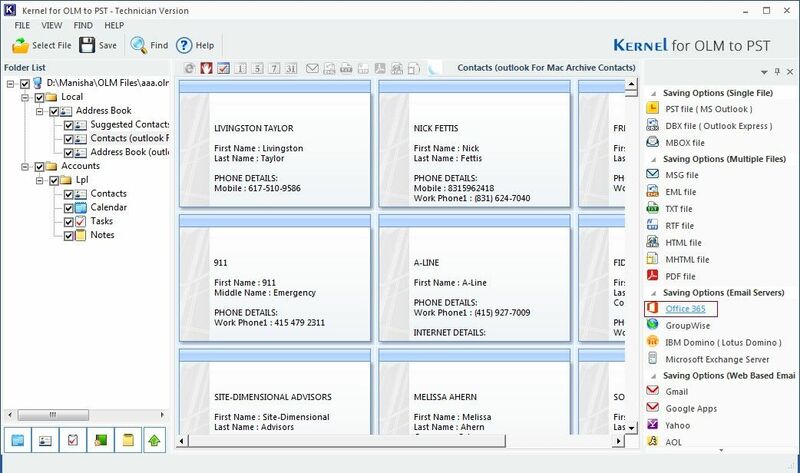 You can select your contacts from where you see the preview of your files and folders. Select the folder of contacts and move ahead. In the filter section, you can apply filter on the contact list too. Is there any size limit for the files and folders I want to migrate? A. No there is no such limitation, you can migrate files and folders of any size. Adding OLM file for migration. 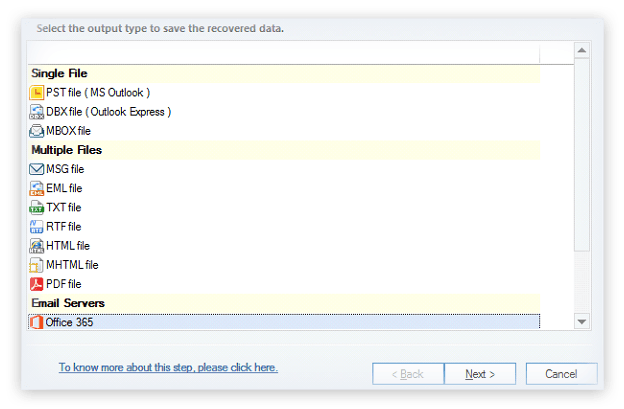 Recover and save corrupt EML emails to PST, MSG, or Office 365.